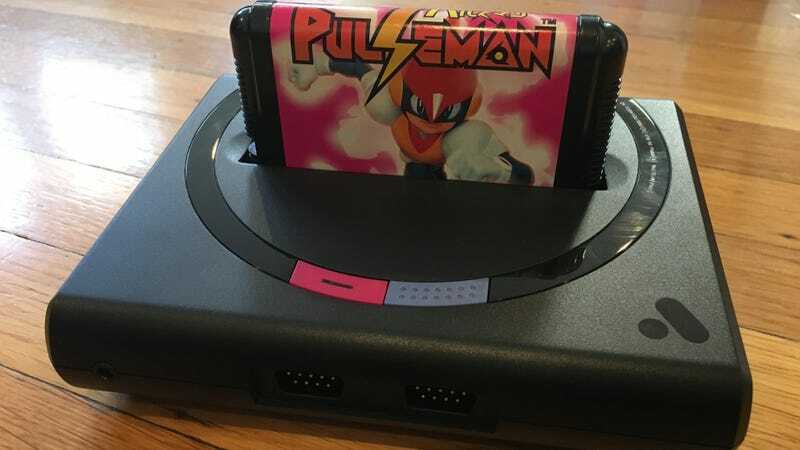 Its method for accomplishing this is the reason for its premium price tag and also is what makes the Mega SG different from nearly every other retro console on the market. Instead of a cheap computer running a software emulator, Analogue’s systems use a device called a “field-programmable gate array,” or FPGA. This means that the Mega SG recreates the designs of the chips on the original Genesis board. It’s not a computer running an emulator that lets it interpret ROM files. For all intents and purposes, it is a Genesis. Sonic The Hedgehog running on the Mega SG using default settings. An adapter included in the box lets the system play 8-bit Sega Master System cartridges (though not the smaller, credit card-sized card games). Again, I threw some wacky stuff at it, like the Brazilian version of Street Fighter II released in 1997, and the Mega SG handled them with aplomb. More adapters, to be sold for $10 each when they are released later this year, will let you plug in Master System cards, Game Gear games, and games from Sega’s Japanese SG-1000 and SG-3000 systems. Just one of the Mega SG’s many, many options menu screens. Turn on the Mega SG and you’ll get a great-looking picture and sound, but if you want to tweak any of that stuff, you can dive into the panoply of different sliders and checkboxes in its menu to fully customize the experience. Want to turn on different shaders to smooth out the pixels, or customize the faux CRT filters until the image looks exactly like the Trinitrons of your youth? Go nuts. You can even select from different waveforms to use for the Genesis’ FM sound output, which will change the timbre of the music. There are some limitations. While you can hook up a Sega CD to the unit, you can’t use that other Genesis add-on, the 32X. The reason for this is that the 32X uses analog video mixing, and the Mega SG only supports HDMI. That’s also something to bear in mind if you were considering hooking this up to an analog television set, because out of the box, you can’t. You also can’t use light guns, but that’s because vintage light guns don’t work with HDTVs. So, abandon those dreams of breaking out your old Sega Menacer. Mega SG even includes a brand new game pre-loaded into its firmware: Ultracore, a Genesis game developed, but never before released, by DICE. The 8Bitdo M30 wireless controller.